Is Your Dog Suffering From Anxiety? Is Your Dog Suffering From Canine Distemper? "20% of our website advertising earnings are donated to local NGOs for stray dogs and animal welfare." Scientists in southwest China’s Yunnan province have cloned what they called the ”Sherlock Holmes of police dogs” in a programme they hope will help cut training times and costs for police dogs, state media reported on Wednesday. 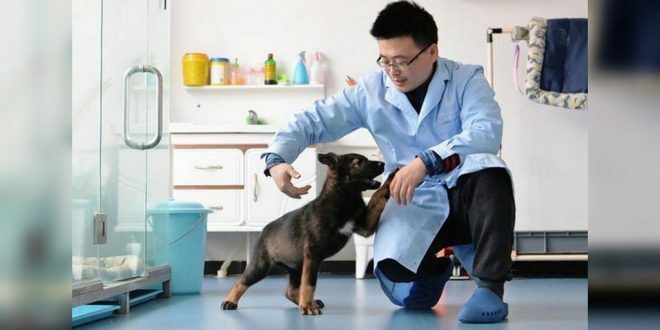 The dog, named Kunxun, was cloned from a police sniffer dog by the Beijing-based Sinogene Biotechnology Company and the Yunnan Agricultural University, with support from the Ministry of Public Security, the state-owned tabloid Global Times reported. Sinogene is hoping to make it possible to achieve “volume production” of cloned police dogs in order to significantly reduce training time, the company’s deputy general manager Zhao Jianping told the Global Times. He added that cloning costs remain a major obstacle. Kunxun, now three months old, will undergo extensive training in drug detection, crowd control and searching for evidence, and will become a fully fledged police dog when it is about 10 months old, the official China Daily said. Training usually takes about five years and costs as much as 5,00,000 yuan, with no guarantee of success, the paper said, citing an animal expert at the Yunnan Agricultural University. The paper did not say how much a cloned dog would cost. South Korean scientists created the world’s first cloned dog in 2005, and two years later the country began employing cloned Labrador retrievers to sniff out drugs for the customs service, China Daily said. This article has not been edited by DogExpress team. DogExpress is an all-inclusive information hub dedicated towards dogs. This site is packed with information on everything associated to dogs. From dog breeds to dog lifestyle, news, inspiring pet stories and many more! DogExpress acts as your one-stop resource for all information related to dogs. "LIFE IS BETTER WITH A DOG BY YOUR SIDE"
Copyright © DogExpress. All rights reserved. *We respect your privacy and take protecting it seriously.